New. 2013. Adr. Hardcover. Stay connected the classic way. Featuring an A to Z of Julia Rothman's colourful illustrations of analog treasures from rotary telephones to typewriters, this address book with concealed wire-O binding is a handy place to keep tabs on contacts. Num Pages: 140 pages, 1C interior spread; 21 4C tabs. BIC Classification: WZS. Category: (G) General (US: Trade). Dimension: 174 x 191 x 24. Weight in Grams: 538. 140 pages, 1C interior spread; 21 4C tabs. Stay connected the classic way. 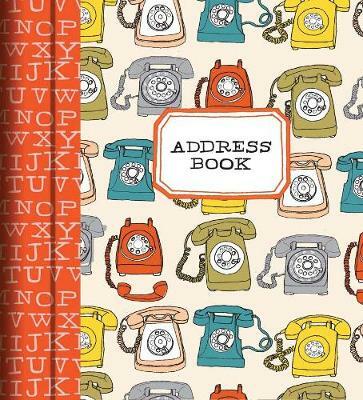 Featuring an A to Z of Julia Rothman's colourful illustrations of analog treasures from rotary telephones to typewriters, this address book with concealed wire-O binding is a handy place to keep tabs on contacts. Cateogry: (G) General (US: Trade). BIC Classification: WZS. Dimension: 174 x 191 x 24. Weight: 532......We ship daily from our Bookshop. Very Good. 1452114188 Minor shelf wear.